Enlist in the most explosive gaming event of the spring: the Gears of War 3 Multiplayer Beta! 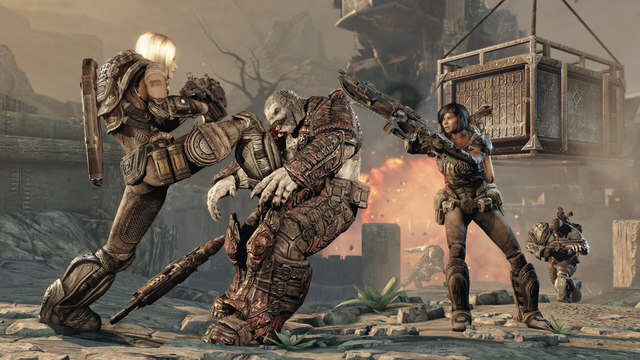 Get into the Beta by preordering Gears of War 3 through select retailers. The Beta begins April 25 and ends May 15. For those of you who purchased the Bulletstorm Epic Edition (on Xbox 360 only), you get early access to the Beta, beginning April 18. Three new multiplayer modes and four exclusive maps will be rolled out during the Beta period -- all running on dedicated servers. This is your chance to help shape the most anticipated game of 2011. In the Beta you can play Team Deathmatch mode on the four new maps (Thrashball, Checkout, Trenches, and Old Town); Capture the Leader and King of the Hill gameplay modes will be added later in the Beta period. Also, be sure to look out for a surprise event weekend that you won't want to miss. Not only will you get an early taste of the final chapter in this blockbuster trilogy, but you'll also have access to exclusive content that you can permanently unlock and carry over to your Gears of War 3 gamer profile when the retail game launches on September 20. Beta Tester Medal -- Wear it proudly, Gear. Thrashball Cole -- Unlock Thrashball Cole to play as Augustus Cole as he was before Emergence Day -- a legendary Thrashball athlete known for his ferocious, flamboyant style. Complete 50 matches in any game type to unlock for the Beta period. To permanently unlock, complete 10 matches as Thrashball Cole during the Beta period. Gold-Plated Retro Lancer -- Before the chainsaw bayonet was deployed at the beginning of the Locust-Human War, the original Lancer assault rifle had a large fixed blade. Complete 90 matches in any game type to unlock for the Beta period. To permanently unlock, score 100 kills with the Gold-Plated Retro Lancer during the Beta period. Visit one of these participating retailers for your pre-order today! Stayed tuned for Beta updates!